Can-Sky Roofing > Blog > Roofing > Which is the Best Flat Roof Option for Me? Which is the Best Flat Roof Option for Me? When it comes to selecting the type of flat roof for your project, there are some things to consider. Do you want a multi-ply or single-ply roof? What elements will it have to withstand? What cost can you afford? Are you concerned about colour choice? Once you have thought about these questions, along with others, you will then be able to decide on the kind of roof you need for your building. Multi-ply roofing consists of several layers of roofing materials. Can-Sky Roofing offers two different varieties of multi-ply roofing. 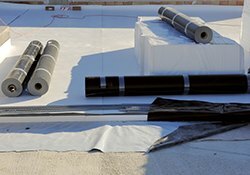 Built-Up Roofing (BUR) – BUR is made of four plies of felt laminated together with liquid hot asphalt bitumen, and covered with ballast. The felts provide power and stiffness, while the asphalt waterproofs the material. The ballast toughens the surface, protecting from UV rays and providing fire and wind resistance. A significant portion of new and existing roofs in Ontario are of this type, and it is the oldest roof system with the longest average service life when taken care of properly. 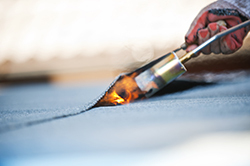 Modified Bitumen (Mod-Bit) – Mod-bit is made of two plies of reinforced membranes fused together with liquid hot asphalt bitumen, thermofused with a blowtorch, or applied cold with adhesives and hot-air welded at the seams. The membranes are reinforced with either polyester or fiber-glass. Mod-bit is divided into two types depending on which copolymer it is enhanced with. Atactic polypropylene (APP) is a plastic copolymer that grants the asphalt bitumen more flexibility, ductility, and elasticity. Styrene-butadiene-styrene (SBS) is a rubber copolymer and it allows the asphalt bitumen to have the same elastic and flexible properties as the APP, but in lower temperatures. Colder environments, like Canada, do well with SBS mod-bit roofing. Mod-bit is available in a variety of colours to suit your needs. 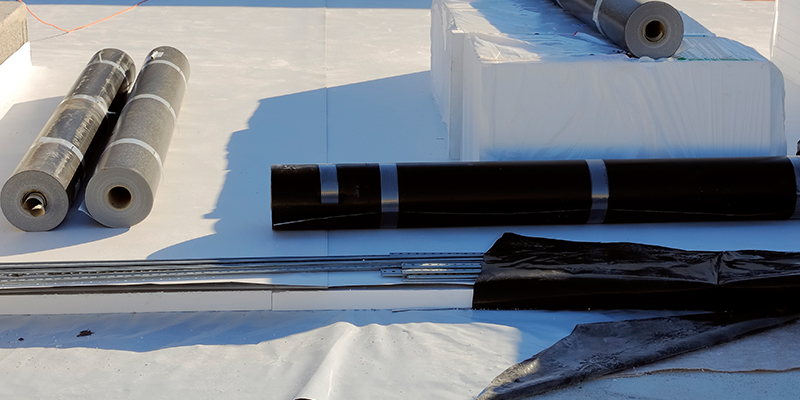 Single-ply roofing is one ply of roofing membrane. While newer to the roofing materials market, they are growing in popularity and market share in new and existing roofs in North America. Can-Sky Roofing offers three different types of single-ply roofing. Ethylene Propylene Diene Terpolymer (EPDM) – EPDM is one ply of synthetic rubber adhered together. It can stretch and contract repeatedly and maintain its original size. It is applied in one of three ways, either fully adhered, fastened mechanically, or with a loose-laid and ballasted system. EPDM has a high resistance to UV radiation, and is also very strong against tears. It does not do well when exposed to fats and oils, as these will break down the EPDM material. Lightweight and waterproof, EPDM is available in black and white. Polyvinyl Chloride (PVC) – PVC roofing is a single-ply of the polyvinyl chloride material. It is a weldable thermoplastic, and is often mixed with other compounds to add to its properties. PVC is typically applied fully adhered, or mechanically fastened. Throughout the lifetime of the roof, the material continues to be weldable. It is very reliable, and can resist high winds, heat, and dirt effectively. PVC is available in many colours, styles, and thicknesses. It can be quite slippery though, so safety is required when walking on it, particularly during wet or snowy weather. Thermoplastic Polyolefin (TPO) – TPO is a single ply of thermoplastic polyolefin. Like PVC, it is a weldable thermoplastic and is often mixed with other compounds. They are not compatible to be welded with each other though. TPO repels dirt and mold, and is resistant to thermal expansion. It is a relatively new material in comparison to PVC.